Never before have the gates of Camp David been opened to the public. Intensely private and completely secluded, the president's personal campground is situated deep in the woods, up miles of unmarked roads that are practically invisible to the untrained eye. Now, for the first time, we are allowed to travel along the mountain route and directly into the fascinating and intimate complex of rustic residential cabins, wildlife trails, and athletic courses that make up the presidential family room. For seventy-five years, Camp David has served as the president's private retreat. A home away from the hustle and bustle of Washington, this historic site is the ideal place for the First Family to relax, unwind, and, perhaps most important, escape from the incessant gaze of the media and the public. It has hosted decades of family gatherings for thirteen presidents, from Franklin D. Roosevelt to Barack Obama, including holiday celebrations, reunions, and even a wedding. But more than just a weekend getaway, Camp David has also been the site of private meetings and high-level summits with foreign leaders to foster diplomacy. Former Camp David commander Rear Admiral Michael Giorgione, CEC, USN (Ret. ), takes us deep into this enigmatic and revered sanctuary. 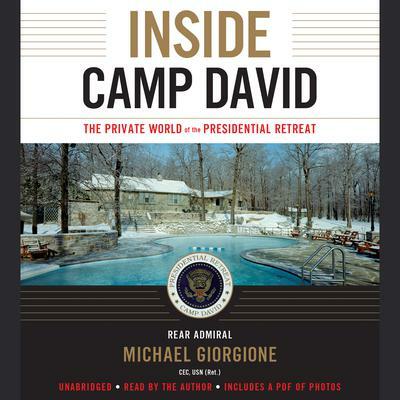 Combining fascinating first-person anecdotes of the presidents and their families with storied history and interviews with commanders both past and present, he reveals the intimate connection felt by the First Families with this historic retreat.